Everything's more fun on a stick, right? Kids love food on a stick as well as many adults like me, lol. I believe I've mentioned that my all time favorite is satay, which is meat on skewers, cooked over a charcoal grill and served with peanut sauce. This is also one of my hubby's favorites. There are endless foods that can be served on a stick, from fruits or veggies to sandwiches or deli items. Really, anything that you like that won't drip off the stick is a possible choice. They are fun, easy to prepare and ideal for party food as well. Here are five examples from lunches which Nikolai has enjoyed. Bento lunch 1: I have a collection of fun bites cutters but I've not used them in a while except for party foods which I mostly used the fun bites square. I used it to cut the square sandwiches and the center was flower shaped cheddar cheese, inserted them to a couple of long picks and the kebabs looked neat and cute. His sides were Annie's organic crackers in a flower silicone cup, organic baby carrots, orange and strawberry slices. This lunch was packed in a Planetbox launch. 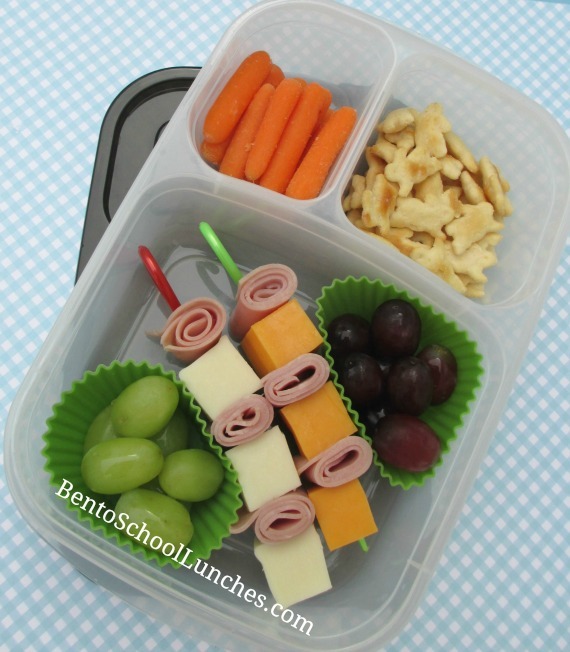 Bento lunch 2: The main compartment contains both mozzarella and cheddar cheese cubes with deli meat kebabs, red and green grapes in round silicone cups. Sides were organic baby carrots and Annie's organic cheddar crackers. This lunch was packed in an Easylunchboxes urban container. 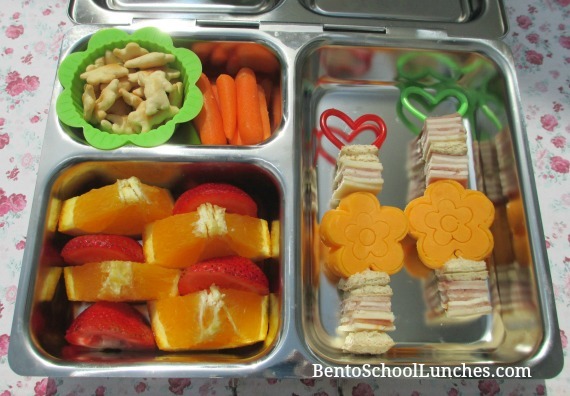 Bento lunch 3: I used my fun bites cube it to cut the sandwiches and inserted them neatly to some heart shaped picks, and he also had Ikea's alphabet wheat cookies, organic baby carrots, crinkle cut cucumber ( I love my little crinkle cut knife), fruit snacks, strawberries and green grapes, all packed in a Bentgo lunchbox. 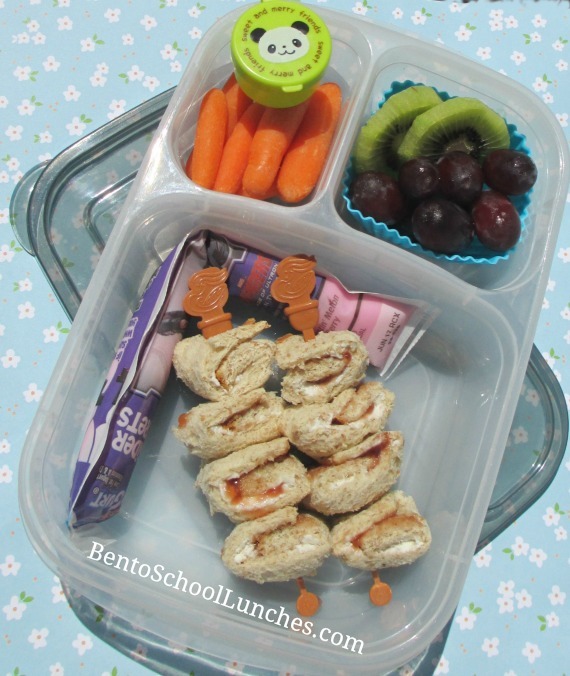 Bento lunch 4: This was a very simple lunch which was grapes kebabs, kiwi slices, yogurt covered star, sandwich cut into half and organic baby carrots. 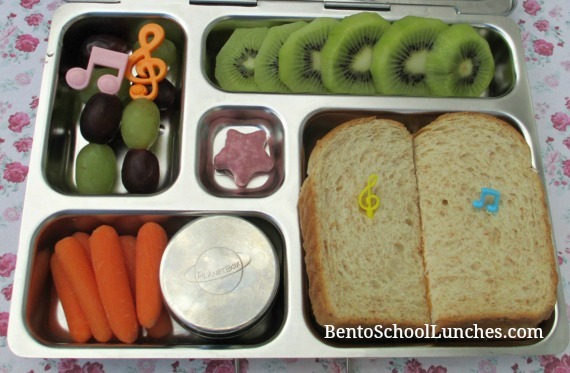 I used some music themed picks for some cuteness and this lunch was packed in a Planetbox rover. Bento lunch 5: Roll-ups cream cheese and jelly kebabs inserted to a couple of Panera Bread coffee stirrers which I used for picks, Yoplait Gogurt, organic baby carrots with hummus in the small green container, kiwi slices and red grapes in a square silicone cup. This lunch was packed in an Easylunchboxes urban. 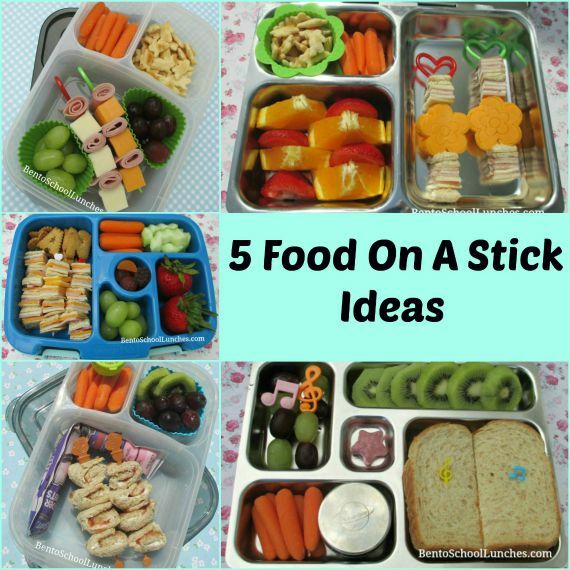 Great ideas and they look yummy! I especially love the flowers kabob! They all look so fun and yummy!! So fun! I do agree that kids tend to enjoy eating food on a stick, and satay is their favourite! Hi Rina! What cool lunches! Where did you get the rainbow heart kebabs from? Hi Steph, thank you so much for stopping by and for your kind comment! I purchased those picks a long time ago from Amazon and have not seen them since. 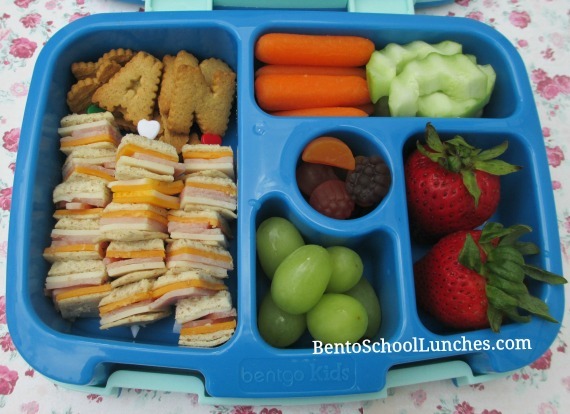 If you like cute picks, you can find them at https://www.bentousa.com/?aff=bentoschoollunches or try Amazon.